Mr. B are hand-rolled premium cigars named after legendary cigar maker Daniel Blumenthal. Blumenthal along with his partner Frank Llaneza, produced a number of famous post-embargo premium cigars such as the Honduran versions of Hoyo de Monterrey and Punch. Mr. B cigars are wrapped in several flavored tobacco leaves, a natural Ecuadorian Sumatra or a dark silky Maduro Connecticut Broadleaf. Both styles of these handmade cigars are infused with Ecuador Sumatra binders and Nicaraguan mixed-fillers that produce a mild and creamy smoke in the natural, and a flavorful chocolate, and spicy smoke in the Maduro. 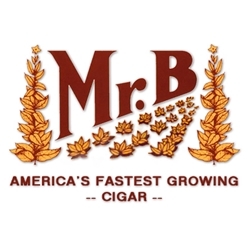 Mr. B is a premium line cigar offered here in affordable bundled packs of 20 cigars each. An excellent high-quality cigar available to connoisseurs everywhere at an everyday smoker's price. Smokers Discounts has made it easy to buy cigars online. A variety of sizes and flavors are listed below at our discount online cigar store. Each of these styles are in stock and available. Call us for more details!